Glue a shell onto fabric for under backing. Let the glue dry. Sew the basic row in even number of L (Fig. 1). Tip: To make the work more comfortable, attach two seed beads during each stitch. When the row is finished, pass through all the beads, pulling tightly on the thread. 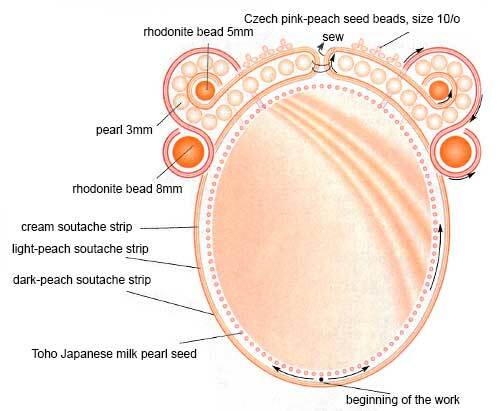 Bead the shell in circular peyote stitch in L (Fig. 2). The number of the rows depends on the thickness of your shell. There are three rows on the thicker side of the shell and two rows on the thinner side in the original design. Go through the last row for several times (that is the halves of the second and third rows), pulling the thread taut. Leave about 3/16 inch (5mm) space around the beaded shell and trim away all the excess fabric. Cut three lengths of soutache braid: cream, light-peach and dark-peach, about 1-foot 3 inches (40-42cm) each. Melt the ends with a cigarette lighter. Connect them together. Tip: While doing soutache embroidery, be careful to run through the soutache braid just in the groove. 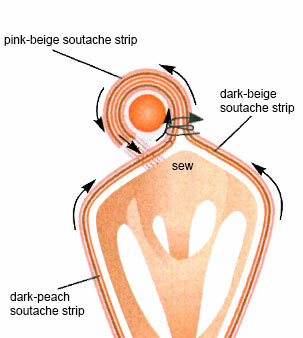 Arrange the soutache braids around the shell and attach them to the fabric. Connect the opposite soutache ends together. Attach G bead at the top of the shell, just in the middle. Now work a symmetrical pattern, incorporating E, B and K (Pic. 1). When finished, fix the soutache ends to the back of the fabric. Side embellishments. 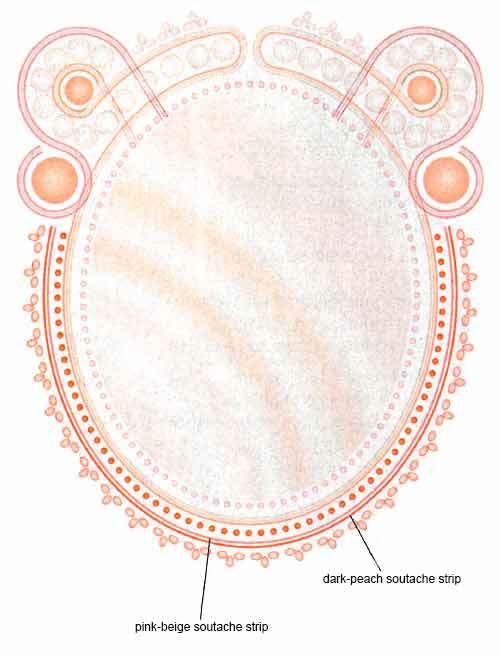 Cut two lengths of wine-red soutache and one length of beige-pink, about 6 inches (15cm) each. Melt the ends with a cigarette lighter. Place the beige-pink soutache in between the two lengths of wine-red and fi them together in a few stitches. See Pic. 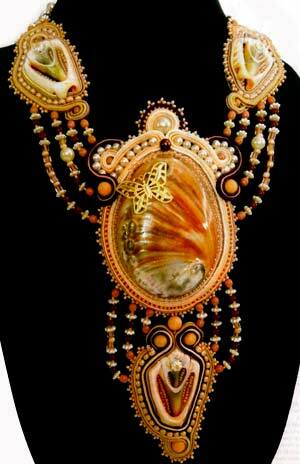 1 to attach the soutache to the beaded shell, incorporating E and A. Work the other side in the same way. Beading along the bottom of the shell. 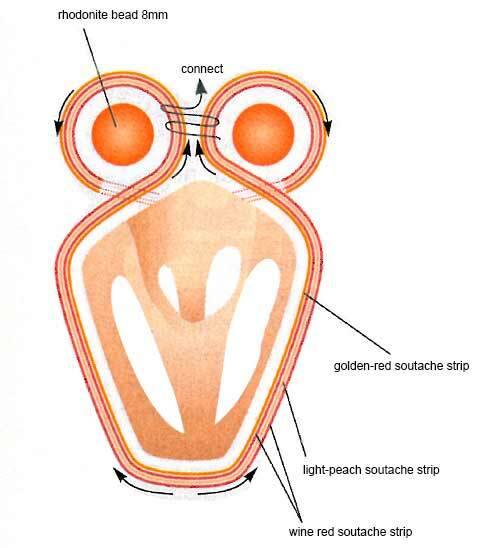 Connect together two lengths of dark-peach and two more lengths of pink-beige soutache. Attach them to the bottom part of the shell, embroidering in M and K (Pic. 2). Beading the top (circle-shaped) element. Cut four lengths of soutache braid, about 3-15/16 inches (10cm) each, and arrange them as follows: dark-peach, light-peach, cream, light-peach. 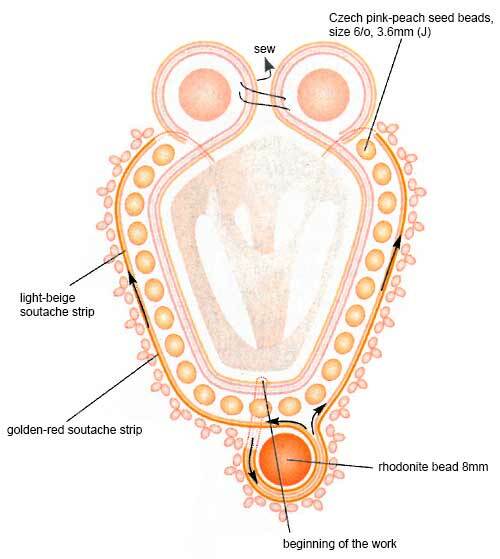 Fix one C in the middle and connect the opposite soutache ends together (Pic. 3). 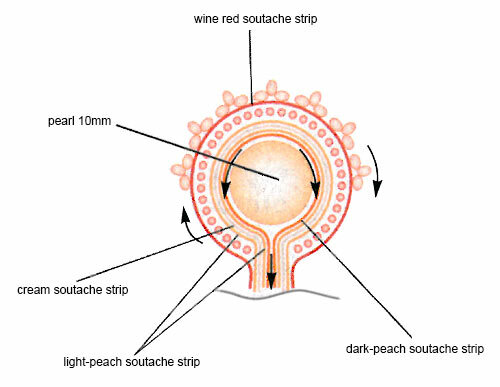 Sew a 4-1/2 inch (11cm) length of wine-red soutache around the element, decorating it with M and K. Attach the finished element to the top of the big shell. Glue thin paperboard and leather to the back side. Glue one cut shell to the backing material. Fill in the holes of the shell in K. Attach one F to the top of the shell, fixing it with M. Leave about 3/16 inch (5cm) space around the shell and trim away all the excess fabric. Connect together four lengths of soutache, 9-7/8 inches (25cm) each, following the sequence: golden-red, maroon, light-peach, maroon. Arrange them round the cut shell, starting the work from the middle of the shell. Connect the opposite soutache ends together. Sew one A bead from each side (Pic. 4). Cut 11-1/8 inches (28cm) of dark-beige and golden-red soutache, and connect them together. Fix them to the fabric, sewing A bead inside (Pic. 5). Work the pattern in J, K (Pic. 5), embroidering both sides of the cut shell. Glue thin paperboard and leather to the back side of the pendant. Attach the bottom pendant to the big shell in the centre by strings of A, B, F and H, I, J, M (see the photograph). Glue the cut shell to the fabric for under backing. Using K, fill in the holes in the middle of the shell. Attach one F to the top of the shell, fixing with M. Leave about 3/16 inch (5mm) space around the shell and trim away all the excess fabric. Connect together three lengths of soutache, 9-7/8 inches (25cm) each, following the sequence: dark-peach, dark-beige and pink-beige. Arrange them round the cut shell, starting the work from the middle of the shell. Connect the opposite soutache ends together. Sew one B bead in between (Pic. 6). 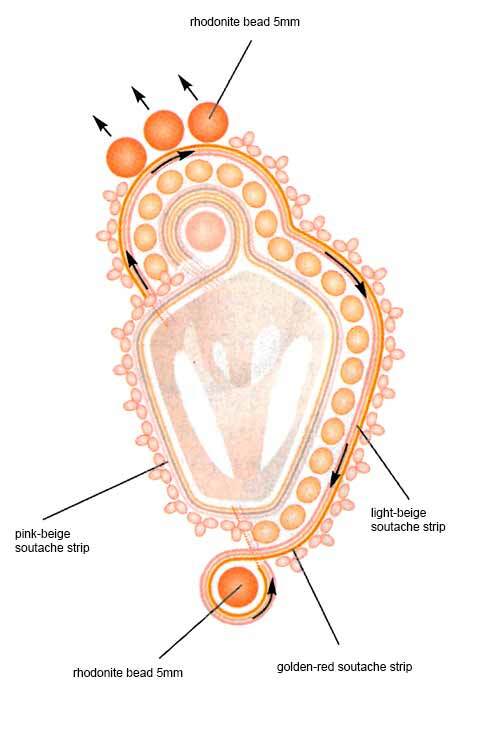 Connect three length of soutache, 7-7/8 inches (20cm) each, following the sequence: pink-beige, light beige, golden-red. Fix them to the fabric. Work the pattern in J, K, and B (Pic. 7). Glue thin paperboard and leather to the back side of the right-hand pendant and work the left-hand pendant in the same way. Connect the pendants to the big shell by strings of B, D, F and H, I, J, M (see photograph). Now attach three more strings of B, D, F and H, I, J, M to the top part of both pendants, fixing them to the three B beads. Join these strings to 3-strand connectors. Finish by attaching jumprings and a toggle clasp.